If you've visited this page before, you might have noticed that the design has changed a bit. We have updated most of the pages. One thing is important to note: my Cohutta Springs History page has a new address. If you are using the buttons at the top of the blog, this should not be a problem, but some of my text links for that page may be broken. I had to disconnect my custom domain name from it temporarily, because of an error. My site is hosted at Blogger, so the address will have blogspot in the name. Otherwise, it's about the same. The error is most likely to occur when searching for the page from a search engine. The old page is very likely to come up in the results, and alas, the link is broken. I hope to get this fixed soon. Just bear with us as we make a few upgrades. Thank you! 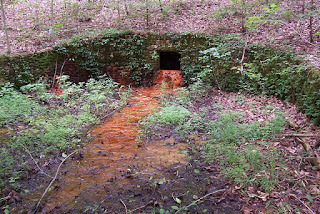 The strange-looking stream of water coming from the spring in this old wall is chalybeate water, colored orange by the iron in it. These mineral springs were thought to be healthy. The stated cures were for everything from colic to brain moisture, strangely enough. People traveled from miles away to drink it and bathe in it. The old wall is on private property in the woods of the old Cohutta Springs community, off of Cohutta Springs Road in Crandall, Georgia. The springs are near the ruins of the old hotel and mill, of which there is little left but the chimneys. Fresh spring water pouring over a waterwheel is such a pretty sight. It brings a feeling of nostalgia for the old days. I always wish I could have seen the old Cohutta Springs mill when water still flowed over the wheel. The historic grist mill at Cohutta Springs is no longer there; but at one time, it brought people for miles around. They came, not just to grind corn or wheat, but to hear good music and dance! The top floor of the mill was a dance hall. Across from it, and connected by a walkway, were the old resort and mineral springs. 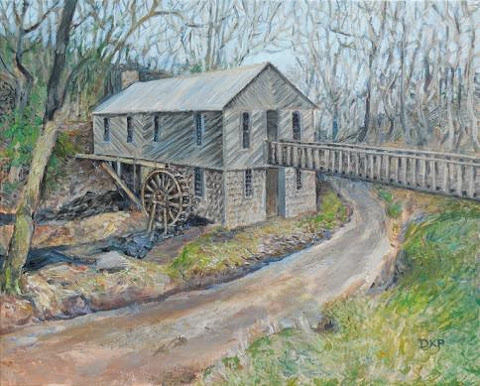 The site of the old mill was in North Georgia, near a town now called Crandall. Remembering the late 1960s and early '70s, people in Murray County and round about still loved to take a gallon jug and dip water out of a clear spring. There were several springs in Murray and surrounding counties. Our family often went to Ringgold, in Catoosa County, and while there, we would get several gallons of water from the spring. It was so clear and cold. There were periwinkles in the spring (tiny freshwater mollusks with black spiral shells), and we children loved to find them and play with them. Mother would scold if we got too close to the source. She made us go further downstream so as not to play in the drinking water. We also picked watercress, which we loved to eat (mixed with garden lettuce and spring onions, pouring bacon grease over them in those naive glory days of good eating). It's hard to remember my first glimpse of Cohutta Springs (the old community). My father and his people were from Murray County. About once a year or so, around Thanksgiving, we would travel into Murray on our way up to Conasauga, Tennessee, to see Dad's uncle and cousins. They lived in an old unpainted house ~ one of those picturesque primitive cabins, complete with outhouses, that people like to recall in their travels through the South. On our way up there, Dad would stop by the old house where his grandfather used to live. It was in the old Adair community and is falling down now. We also went to see the old Coffey grist mill in the Cohutta Springs community. We had to cross a little flat bridge that was made of thick, wooden beams. The outside of the mill was shingled in thick wooden slabs that I thought very pretty. The bridge was still strong and the mill seemed like it would be there forever, I thought. A few years later, we visited it for the last time. It was dilapidated by then, and boards were already starting to fall into the creek. Cohutta Springs is on old maps in several places. The "other" Cohutta Springs is west of the one we've talked about. It's in the Tenth District, Third Section of Murray County, on Georgia Highway 225, and is better known as "Colvard's." The place name of Cohutta Springs came about because there were several mineral springs. Their source was the nearby Cohutta Mountains. The springs became popular as watering places. Boarding houses and resorts sprang up in the area. Little towns began to be named for the springs. Post offices opened and closed nearby. As one or the other area became frequented by residents and tourists, the place names began to appear on maps. The main part of this site explores the Cohutta Springs resort area that sits right at the foot of Grassy Mountain (just off of U.S. Highway 411 in Crandall, Georgia). The other Cohutta Springs (or Colvard's) is in the northwestern part of Murray County, on Georgia Highway 225. Old Doc Colvard once owned a plantation there. The antebellum plantation (privately owned) still sits at the crossroads there. The wellspring is gone. Earlier owners of the plantation were Waterhouse and McCroskey. It was never famous, but it was mentioned here and there in Civil War correspondence. That area was more prominent in census (because of the early post office there), so genealogists will do well to take a look at it. We'll explore that "other" Cohutta Springs as we travel through Murray County's history. To get a better idea of these various areas, take a look at our Maps page. Cohutta Springs is no longer a town, but it is a busy community. Local businesses still use the place name. Cohutta Springs Conference Center is located very near the old resort. The center has three motels, chalets, and cabins. Other businesses include farms and a greenhouse. Crandall, Georgia, is Cohutta Springs' current post office.